BEFORE–Dirty Looking Soiled Wide Grout Before Tile Steam Cleaning. Notice the tile is brown and the grout is black–it’s not the color they’re supposed to be, but it’s the cleanest the client can get them. 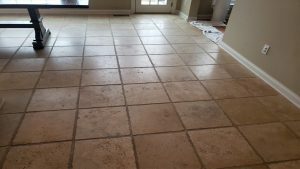 The fact is, people usually forget what their tile really is supposed to look like until we clean it for them. Tile cleaning is tough work. Grout cleaning is even harder, especially, if you’re using a toothbrush and elbow grease, but a quick phone call or email to schedule tile and grout deep cleaning services with SPARKLE Surface Care can change all that. Our trained technicians use specialized equipment to extract deeply embedded dirt and grime, thoroughly cleaning and sanitizing your tile, grout, and baseboards. We use nonabrasive yet effective methods with adjustable heat and pressure for deep-down clean. 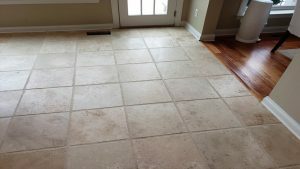 We service tile and grout floors, shower walls, tub surrounds, hot tub surrounds, pool decks, table tops, and more throughout the South New Jersey area. AFTER–Fresh, grout cleaned, disinfected, and uniform looking. Note the grout is white not black, the tile is light beige not dark brown. This is typical. Don’t believe me, wait until I show you the mucky mess your floor turns into as we prep it before we steam it. Now imagine this. Many people have tile counters and those have all the same problems. Millions of microbes and bacteria are hiding out in that grout and in the crevices of the tile. We clean up to an inch deep and sanitize. Then we can seal it, which keeps it clean and makes it clean up so much easier for a long long time. This client chose NOT to seal. After seeing this, can you imagine making the mistake of not sealing? She is going to need us out in a third the time because of that fateful decision and have a harder time keeping the floors clean. After your tile and grout are deep cleaned and sanitized, take advantage of our grout sealing services. We use the highest quality grout sealer available for the best protection. Grout sealer is absorbed into the porous surface, filling in the tiny holes where contaminants collect. It leaves your floor with a clean and fresh look that is much easier to maintain because regular cleaning is more productive. For a FREE estimate on residential or commercial tile and grout deep cleaning, sealing, and color sealing services throughout the South New Jersey area, contact us online or call (609) 953-0472 today.